has been deployed extensively during the 2014 War. Israeli drone makers work closely with the military, using the conflict zones surrounding the country to develop their systems in real world operations. Many drones were tested during Operation Protective Edge in the skies above Gaza, on the ground, and in tunnels beneath the surface. These systems can be marketed to foreign clients as 'combat proven', the highest standard of reliability. Ezz Al Zaanoon, a Palestinian photojournalist. "The most frightening [thing] for me as a journalist, when I go on the ground to make photos, is the drone. Because it's one press on a button and I can die. Drones are a sign here for Gazans, everyone knows it, everyone has an experience with it somehow." Over the years, armed aerial drones have played a larger role in Israel’s fight against armed Palestinians on the ground. A report on the 2014 Wart by the Palestinian Center for Human Rights attributed almost one-third of all civilian casualties – 496 persons out of 1543 total civilians killed - to drone strikes. The Iris mini-tactical robot at the RoboTeam factory. RoboTeam specializes in building unmanned ground vehicles for use inside buildings, tunnels, and other urban environments. The company worked with the Israeli military during the war in 2014 to create a prototype robot that was used to clear tunnels near the border with Gaza. Inside a home that was hit by an Israeli airstrike during the 2014 War. A warhead, from a missile that failed to detonate during the 2014 War, encased by a fragmentation jacket. The jacket is composed of thousands of tiny metal cubes, known as shrapnel, which increases the weapon's lethality against 'soft' targets. The warhead is most likely from a LAHAT missile, manufactured by Israeli Aerospace Industries (IAI), Israel's largest aeronautics company. A shrapnel cube, 1mm in size, from the warhead of what is most likely an Israeli-made LAHAT missile that failed to detonate during the 2014 War. An Israeli soldier from the Sky Rider unit launches a Skylark drone during a demonstration. The Sky Riders are intelligence units commanded by the artillery brigade in the Israeli army. Photographers are instructed not to show the faces of soldiers in the unit. Eslam Shamali stands amid the rubble of her destroyed home. Eslam’s brother was a Hamas commander who died fighting in this neighborhood during the 2014 War. Her mother, father, and another brother were killed in the family's home, which was destroyed during the same battle. "For me as an adult, it's not a big deal for me to hear the sound of the drones, if it is in the night or the day, I got used to that and I know that it's not something healthy for my psychological situation, but that's the reality." Inside a hangar at IAI's main production facility that is used as a factory and showroom for the company's drones. Israel pioneered the use of aerial drones in the 1970’s and 80’s, first integrating the technology into combat operations during wars with Lebanon and other Arab states. Early experience on the battlefield (and continuing conflicts in the region) aided the development of a robust drone industry that has emerged as one of the top global exporter of drone systems in the world today. An impact crater from the 2014 War. Sadki Chaheen, a farmer who lives and works close to the border with Israel. When drones fly above the area, farmers are reluctant to work in their fields for fear of being targeted. "Usually one drone or two drones fly above our fields. If we hear the sound of the drone and it is really close and if there's more than two drones in the sky we recognize that something wrong happened in the buffer zone areas and we start to escape from our fields immediately." An optical payload is pointed out a the window as it undergoes calibration at a factory belonging to Controp, an Israeli company that specialises in optics and camera systems used by drones. Ibrahim al-Remahi shows where he was injured during a drone strike during the 2014 War that targeted his family and killed two of his daughters and a son. "I evacuated the house with my family and I went with my sons to pray. We finished and suddenly the drone missile targeted us - the type of missile that has the small metal cubes. I received one cube on my neck beside my liver here. My son was killed directly in front of my eyes. After the missile targeted us, I looked around and suddenly I realized that also I'm bleeding. So I start to put my hands on the parts that bleed and after that there was another rocket that hit my two daughters. After that I just saw myself in the ambulance and I spent more than 20 days in the hospital. I had a surgery in my stomach because of the shrapnel. I didn’t see my family that got buried because I woke up after 20 days." A scar on Ibrahim al-Remahi’s hand from he airstrike, where a small piece of shrapnel remains under his skin. Pieces of the two missiles that struck the al-Remahi family. Near Petah-Tikva, Israel - An optical payload inside of a shipping case at the Controp factory. A slaughtered inside inside a house that abandoned after an Israeli artilery bombardment during the 2014 War. An employee at the Aerosol factory making airframe components. Aerosol is a small company that mainly manufactures pieces of UAVs and other aircraft for larger companies in Israel. A damaged billboard, memorializing Palestinians who were killed fighting Israel. Children play beneath a poster memorialising a Palestinian fighter. A young boy marching in a parade of al-Qassam youths in Gaza City. Al-Qassam is the military wing of Hamas, the Palestinian-Islamist political regime that has ruled the Gaza Strip since 2007. The Orbiter drone inside the Aeronautics Defense Systems factory in Yavne, Israel. 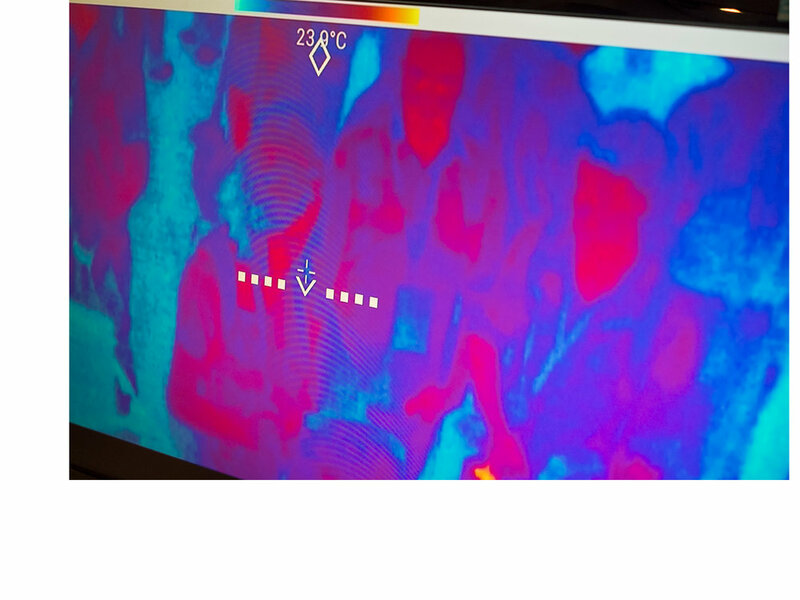 A thermal-imaging system on display at an conference for Israeli defence-technology companies held two months after the 2014 War in Gaza. Palestinian children displaced by fighting during the 2014 War at a UN school. Shrapnel damage at the site of an Israeli drone strike that killed a fifteen year old boy in 2012. An Aeronautics Orbiter 3 flies overhead during a demonstration put on by the company for foreign clients. Ground control stations used to pilot large drones, built inside of camouflaged shipping containers at IAI’s main production facility. The Military Tactical Ground Robot, made by the Israeli company Roboteam, during a demonstration at their factory. A protective suit worn by Palestinian explosive ordinance disposal technicians, on display inside a police station. Muhamed al-Silawi holds his son on their roof. Muhamed survived a drone strike while praying inside a mosque in 2009. "The concept of the drone has become like someone who physically exists inside our houses. Like if we would like to have our breakfast we leave space for someone to eat, the drone is exactly the same - it exist in every single detail in our daily life. And for me as a father who should protect his sons from any danger, I'm trying always to do something to lessen the fear for my children, and get them to focus on something else, when they hear the sound of the drone."